Video walls, we’ve all seen them in different shapes, sizes and configurations. The beauty of this market segment is what can be accomplished with a series of flatpanel arrays designed to work seamlessly together. Well, I’d like you to consider going back to thinking “inside the box” a bit when it comes to video walls, literally. 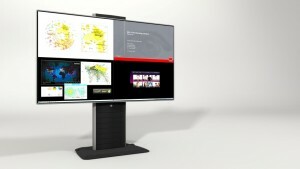 Barco recently released a new product segment called “OBLX” & “OBPX” (L for Landscape and P for Portrait orientation) free standing, self-contained, preconfigured highly attractive video walls. So cool in fact that Barco just won a Red Dot award for best of the best in new AV design. In a day and age when awards are handed out like Halloween candy, this was won going up against 4,815 entries! And even though these two products are self-contained, they’re still is a certain level of flexibility. See how this product can be extended horizontally. Where it has been a fit out of the gate has for the most part been in control room and NOC applications. But from my perspective (and at the risk of sounding a bit biased because I manage the Barco business for Almo) I see a number of different potential applications for this solution such as common areas in Retail, Corporate, Higher Education as well as Government. And because of the screen size, there’s also a potential fit in larger briefing rooms and conference centers in hotels. Take notice though, I said potential. This is new ground for us with this product. The reason for a product specific post such as this is I really do want your feedback and thoughts about the relevance of this form factor to your business. Could it be possible that this “inside” the box solution could get you to think “outside” the box with your next video wall application?